With "PlayMemories Home", you can share photos and videos with your friends and families. - Uploading photos to "PlayMemories Online"
Uploading photos and videos from "PlayMemories Home" to "PlayMemories Online" enables you to share them with your friends and families using "PlayMemories Online". See pmh-upload.html for uploading photos and videos from "PlayMemories Home" to "PlayMemories Online". See browser.html for details on how to use "PlayMemories Online". 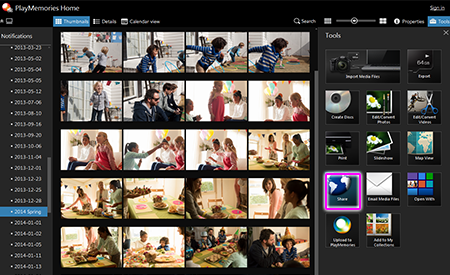 You can upload media files to social networking sites or the like with a simple operation. 1. Click [ Tools] - [Share], and then select your desired site. 2. Select the media files you want to upload from the thumbnails, then drag and drop them into A, and then click [Next].